The Expotool Kiev 2009, a worldwide trade fair for introducing Machine Tools, Tools, Metalworking, Manufacturing and Welding technologies, is being holded from Feb. 16th and will be end at Feb.19th. Organized at Kiev, Ukraine, various exhibitors of throughout the world display their innovative products to the key specialists on the international podium. Such as gardening tools & equipment, forestry equipment, laser cutting machines, precision tools, specialized tools and equipment, hydraulic hand equipment and accessories etc. This trade show will touch lots of fields including abrasive materials, diamond and cemented-carbide tools, equipment for blasting, equipment for welding, fasteners, forestry equipment, gardening tools & equipment, generators, hand tools, hydraulic hand equipment and accessories, laser cutting machines, power hand tools, precision tools, specialised tools and equipment, surface finishing technologies, tools and equipment for civil engineering, tools and machine-tools for working of metal, wire and piping. So if you are buyers (retailers, wholesalers & distributors, importers/exporters), specifiers (architects, builders/remodelers/contractors), other (media, financial analysts) from every channel of distribution including:Automotive, Catalog/Mail Order/Internet, Discount Store, Hardware Store, Home Center, Home Décor, Kitchen & Bath, Lawn/Garden & Outdoor Living, Mass Merchandiser, Specialty Store, Supermarket/Drugstore and Wholesale Clubs, there is always a good chance to attend. How to Choose a Hammer? Hammer is usually used in our daily life. But few people really know the hammers. Hammers are used for the striking force in order to break or to deform an object and are also a simple tool designed to manually drive nails, brads, and other fasteners into softer materials, such as wood or drywall. How to choose a proper hammer? The types of hammer include the claw hammer, power hammer, sledge hammer as well as the bell pein, cross pein pin hammer and much more. 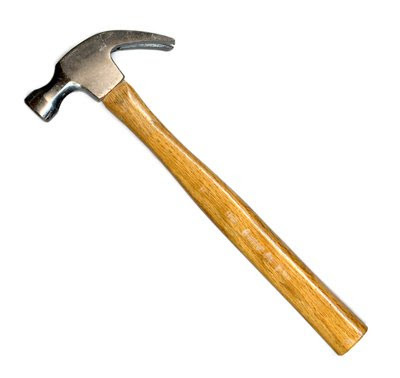 Most construction and household hammers are claw hammers with heads weighing 7, 10, 13, 16, or 20 ounces. From above, you could choose one that fits well. How to Safely Use a Hammer? To safely use a claw hammer, select the weight appropriate to the fastener to be struck. A 7-, 10-, or 13-ounce hammer is adequate for tacks, brads, and small finish nails; 16- and 20-ounce hammers are used for framing and roofing with 8-d (eight penny) nails or larger. Firmly grasp the lower half of the handle, slowly swing the head face, and touch the fastener head squarely to determine trajectory. Make sure your hand will not be struck by the hammer head or handle. Then swing the hammer with more force to drive the head into the wood. Continue striking the fastener head squarely to drive it into the material. After you reading this, I think you will know about hammers well. If this could help you choosing your right hammers, I will feel so glad. Do you like eating spaghetti? 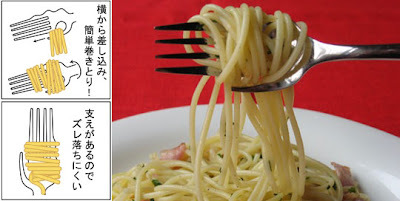 When you eating, do you have some trouble with spining them? Here is a new kind of forks that will help you eating noodles with ease due to its projecting “thumb” piece that simulates a hand. Anyway, I think it will be perfect for any spaghetti or other long noodle lovers. When I was young, I alway saw that my grandmather squinted at the little needle eye, and passed the thread through very difficultly. And I helped her now and then. 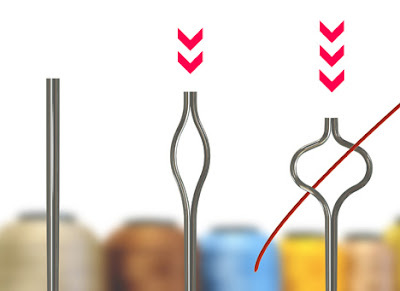 Now there is a novel design on needles that called Big Eye Needle, which is an ordinary loop-eye sewing needle except it’s made of some new fangled metal. 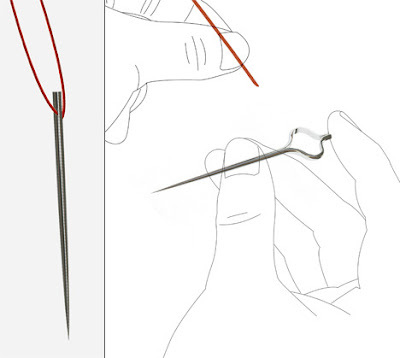 With a bit of pressure, the tiny loop-eye expands to the size of a button hole making threading a cinch - literally. Gone are the days of far sighted clumsy hands and sore thumbs. Damn thread never seems to want to go in without a fight. But there is a flaw on this design that if some one want to use thimble, how would he/she do? Hope the designer could redesign it. In our daily life, we always need to do some repairs. So do you have a trouble of screws? The following screws are designed by professional designer which are some of the outcomes of the resulting exploration into screw heads. 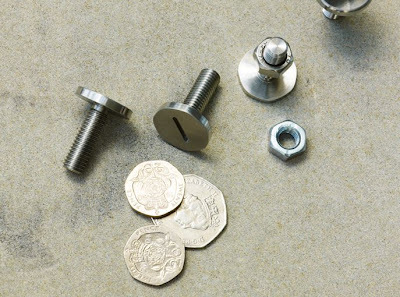 The head of these screws and bolts are shaped wittily to signify the coins that can be used to turn the screws and bolts. This design will ease your trouble.